Criminal charges against U.S. Sen. Robert Menendez, a New Jersey Democrat, could come later this month as a federal grand jury continues to hear evidence in the case, sources familiar with the investigation tell NBC 4 New York. Menendez has been under federal criminal investigation in connection with his ties to Florida eye doctor Salomon Melgen. The senator has admitted he accepted free private plane trips from Melgen, including a 2008 trip to the luxury resort of Casa de Campo in the Dominican Republic. The senator has said he later repaid almost $70,000 for his trips on the doctor’s jet. Both Menendez and Melgen have denied any wrongdoing. 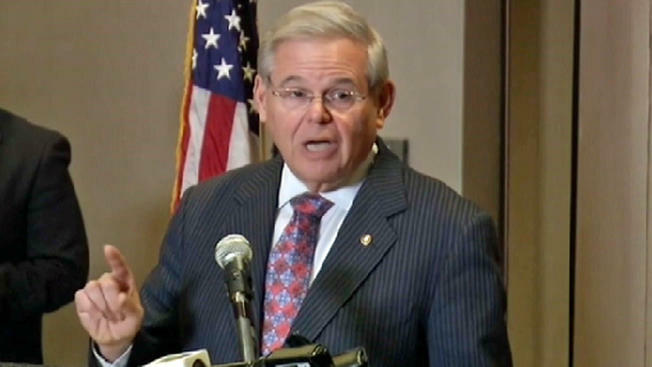 In a brief statement to reporters Friday evening, Menendez said, "Let me be very clear. I have always conducted myself appropriately and in accordance with the law. "Every action that I and my office have taken for the last 23 years that I have been privileged to be in the United States Congress has been based on pursuing the best policies for the people of New Jersey and of this entire country," he said. "I am not going anywhere," he added. Menendez continued, "As for Dr. Melgen, anyone who knows us knows that he and his family and me and my family have been real friends for more than two decades. We celebrated holidays together, we have been there for family weddings and sad times like funerals and have given each other birthday, holiday and wedding presents, just as friends do." Tricia Enright, the communications director for Menendez, said in a statement earlier. " As has been reported, the start of this investigation is suspect. We know many false allegations have been made about this matter, allegations that were ultimately publicly discredited." A spokesperson for the FBI in New Jersey declined to comment on an ongoing investigation. On Friday, the Third Circuit Court of Appeals mistakenly posted a document revealing some of the ongoing work of the grand jury, a document first uncovered by the New Jersey Law Journal (NJLJ). The apparently inadvertent document drop comes a week after the appeals court ordered a hearing into whether two Menendez legislative aides who declined to testify in front of the federal grand jury, citing the speech or debate clause of the U.S. Constitution, must testify or can claim that legislative privilege under Article 1, Section 6. Federal judge Anne Thompson previously had ordered Menendez aides Michael Barnard and Kerri Talbot to testify about the meetings they had with Health and Human Services officials, as well as Custom and Border Protection officials about Melgen, the NJLJ report said. The report said Barnard declined to answer 50 questions during his initial grand jury appearance. A spokesman for Menendez declined to comment on the NJLJ report last week. The Third Circuit Appeals Court said the congressman has the burden of showing the speech or debate clause applies in a case like this. Prosecutors are looking into whether Menendez’s actions on behalf of Melgen were corrupt and not part of the “manifestly legislative” process, NJLJ said. The Justice Department is looking into whether, in exchange for the gifts, Menendez improperly lobbied U.S. officials to help Melgen with business matters. Two key issues include whether the senator improperly helped Melgen in Melgen’s efforts to secure a port security deal worth tens of millions of dollars, as well as helping the eye doctor with Medicare regulators looking into whether Melgen had overbilled Medicare. Investigators have said they are also looking into the senator’s relationship with two fugitive Ecuadorean bankers living in Florida. Brothers William and Roberto Isaias have been sentenced in absentia in Ecuador for looting a bank they once ran there. Isaias family members gave campaign donations to numerous politicians including Senator Menendez. Menendez’s office repeatedly contacted State Department and Homeland Security officials in support of the bankers efforts to stay in the US. Brothers William and Roberto Isaias have said they are innocent of banking crimes in their home country, and are the victims of a political witch hunt by Ecuadorean authorities, and along with the senator, deny any wrongdoing.